In December 2004, I bought my first laptop Fujitsu T4010, which I name it Terminator (the T-series robot send by John Connor from the future). This is a faithful and very very good tablet PC, which still can run things except it has grown louder, hotter and clumsier. I decided I would need to retire it soon on the day that it growls so loudly when I was in NUS library.. 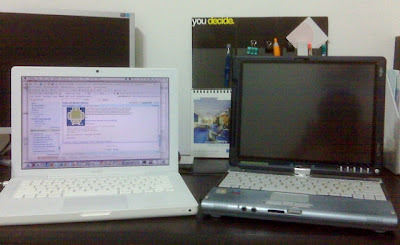 In June 2008, I bought an my second laptop Apple MacBook, which I named it Light. It is white and pure in color, and it runs on the Mac OS X! No more evil M$! I have never use Mac enough to convince me that I should switch to join the light. I make the decision purely on the fact that I see many people using it - credible geeks, professionals, youngsters, and ladies! It is now a change of era. And I do believe Mac will make me more efficient, despite that some softwares cannot be run. Developers are still in the phrase of transitioning, and would now realize Mac is not to be ignored, and hence more softwares will be available from now on! Soon/Already, windows user are complaining why they don’t have what mac have!